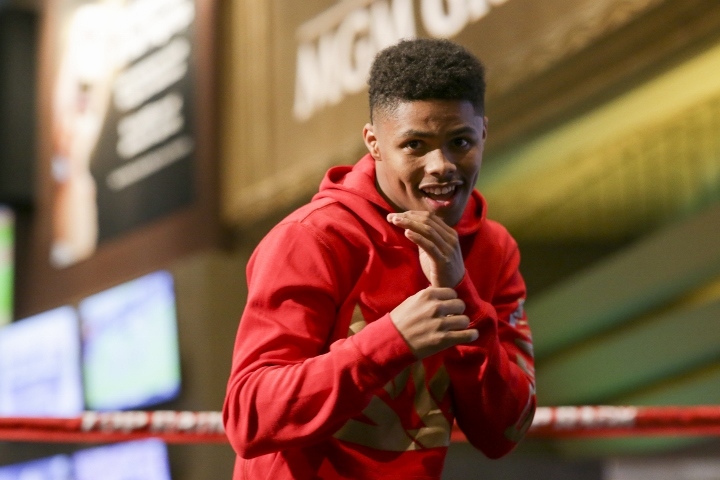 Southpaw Shakur Stevenson wants his first title shot to be against IBF 126-pound champion Josh Warrington in the latter’s home country of The United Kingdom, the undefeated 21-year-old 2016 Olympic silver medalist told host Nestor Gibbs during a recent edition of Tha Boxing Voice podcast. Promoted by Top Rank, Stevenson (9-0, 5 KOs) pursues his second consecutive knockout against Jessie Cris Rosales (22-1-1, 10 KOs) as the co-main on January 18 to heavyweight title challenger Bryant Jennings (24-2, 14 KOs) against Oscar Rivas (25-0, 17 KOs) at Turning Stone Resort & Casino in Veronia, New York. The 28-year-old Warrington (28-0, 6 KOs) has won consecutive split- and unanimous decisions to dethrone IBF champion Lee Selby (May 2017) and defend against two-division title winner Carl Frampton last month, with each victory being considered an upset. “I’m fiending for my [first] title shot to be against Josh Warrington in the U.K. I just watched him fight Carl Frampton and I’m fiending so bad. I respect him and I think he’s a great champion. I ain’t just saying that because I see flaws. I’m saying that because he’s tough. It’s not going to be an easy fight at all for anybody in that division, no matter who,” said Stevenson, of Newark, New Jersey. In his last fight in October, Stevenson used right hooks to floor Viorel Simion (21-3, 9 KOs) three times during a first round knockout, becoming the first man to stop the Romanian veteran. Simion’s other losses were by a pair of 12-round unanimous decisions to former WBA super bantamweight champion Scott Quigg (April 2017) and Selby (July 2013). “By the time I get to a world title, I’ll be fighting at 126. I want a world title at 126 before anything. A world title is not that far [away] as you think. I definitely know what’s coming for me in 2019,” said Stevenson.